When you’re a young job seeker, what’s the first step you take to find the right opportunity? How do you prepare for the interview? What should you include on your resume? And for childhood cancer survivors, when do you disclose a disability, or should you? Are there local resources you can use to help? POGO’s Employment Handbook answers these and many other questions in an easy-to-read format that is sure to give you valuable tips and advice to help get you on the path to employment. Download PDF. Learn more about SAVTI (Successful Academic and Vocational Transition Initiative) and get more SAVTI resources. When a child with cancer returns to school after a prolonged absence, the adjustment can be difficult for everyone. 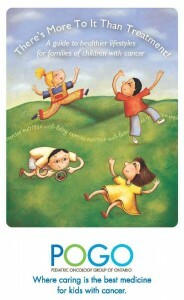 POGO’s Children with Cancer: A Guide for Educators helps the school community prepare and cope. All year long, and especially in September, at the start of the school year, POGO Interlink Nurses help ease the transition back to school by making school visits to answer questions from teachers, administrative staff and students about childhood cancer. These expert nurses are able to explain common types of cancer in children and how they are treated. They talk about medical devices used in treatment, many of which are surgically inserted which means there are restrictions to the child’s play. The nurses help teachers deal with specific health and social issues, including nausea and vomiting as side effects of medication, the child’s feelings about hair loss, and the reactions of others. When the POGO Interlink Nurse leaves the school, the Guide stays behind as a valued extension of the nurses’ face-to-face role. Children with Cancer: A Guide for Educators takes teaching staff on a virtual journey to help improve their understanding of what the child and family are facing, how to support everyone in the classroom, and how to facilitate instruction when the child has to be absent. Download PDF. Learn more about POGO Interlink Nurses. This publication describes a range of programs many families access to manage the financial burden that can arise from their child’s cancer diagnosis. Please note: Programs and services listed may have changed since the Money Matters book and brochures were first published. Please review the information with your POGO Interlink Nurse, social worker or other member of your healthcare team. Download PDF. Learn more about the POGO Financial Assistance Program. 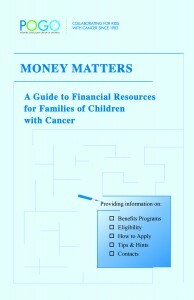 *Check out the Money Matters brochure series. *Information was current at the time of last printing in 2012. Some programs and services listed have been changed. Please consult with your social worker, POGO Interlink Nurse, other member of your child’s health care team or the program itself for the most current information. With information on exercise, nutrition and well-being for children with cancer and their families, this guide to healthier lifestyles was written by clinical professionals, researchers and parents. Download PDF.